GREENLAND – Mark your calendars for April 5, 6, and 7, when the 15th annual Art of Great Bay fine art exhibit and sale takes place at the Hugh Gregg Coastal Conservation Center on the campus of the Great Bay Discovery Center at 89 Depot Road, Greenland. The show opens with a public reception with the artists on Friday, April 5 from 5:30 p.m. to 8:30 p.m. and continues on Saturday and Sunday, April 6 – 7, from 10 a.m. to 4 p.m. More than 50 local and well-known artist and makers of fine crafts will be represented at the event, which is a fundraiser for the Great Bay Stewards, the friends group for the Great Bay National Estuarine Research Reserve. 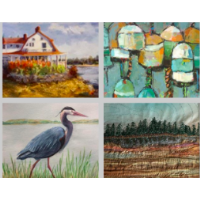 The theme of the show is Art Inspired by the New England Coast and, in addition to painting and photography, visitors will be able to view and purchase pottery, jewelry, sculpture, and small art items. Many of the participating artists have also generously donated original works to be raffled off, along with a raffle for a new wheelbarrow filled with items needed to start a spring garden. On Friday, April 5 from 5:30 p.m. – 8:30 p.m., come and meet the artists and preview the show. On Saturday, April 6 at 2 p.m., visitors from several area assisted living facilities come for free tea and dessert gathering, with live music by accordionist Gary Sredzienski. On Sunday, April 7 at 11 a.m., visitors will enjoy a casual brunch while they view the art show. The entire weekend is free and open to the public. Thirty percent of the sales support the Steward's mission of education and conservation in the Great Bay Estuary, and while at the exhibit, visitors can also walk the grounds of the Great Bay Discovery Center and enjoy the boardwalk that leads out to beautiful views of Great Bay. The Great Bay Stewards would like to thank its sponsors for supporting this important event, including Piscataqua Savings Bank; Bay Breeze Dentistry; Living Innovations; Brick & Barn Real Estate Group; Boldwerks, Hoefle, Phoenix, Gormley & Roberts P.A. ; Coastal Design Magazine and, for the sixth year, lead sponsor, RiverWoods Exeter. For information, contact Allison Knab, Executive Director, Great Bay Stewards at allison.knab@greatbaystewards.org or (603) 778-0015.